Hiya guys! Anyone else wishing it were Friday already?! Talk about a very slow week. It's like I can't ever be satisfied, I mean just the day I was saying how time is moving quickly haha. Father time must be saying, "Make up your mind woman!" in his little time cave of wonder. I think I may be partially on a sugar high this morning. My friends on WoW sent me a birthday surprise box filled with home-baked goodies. Peanut butter cookies, white chocolate cheesecake, vanilla sugar cookies, and so much more. I'm not running out of sweets any time soon that's for sure. 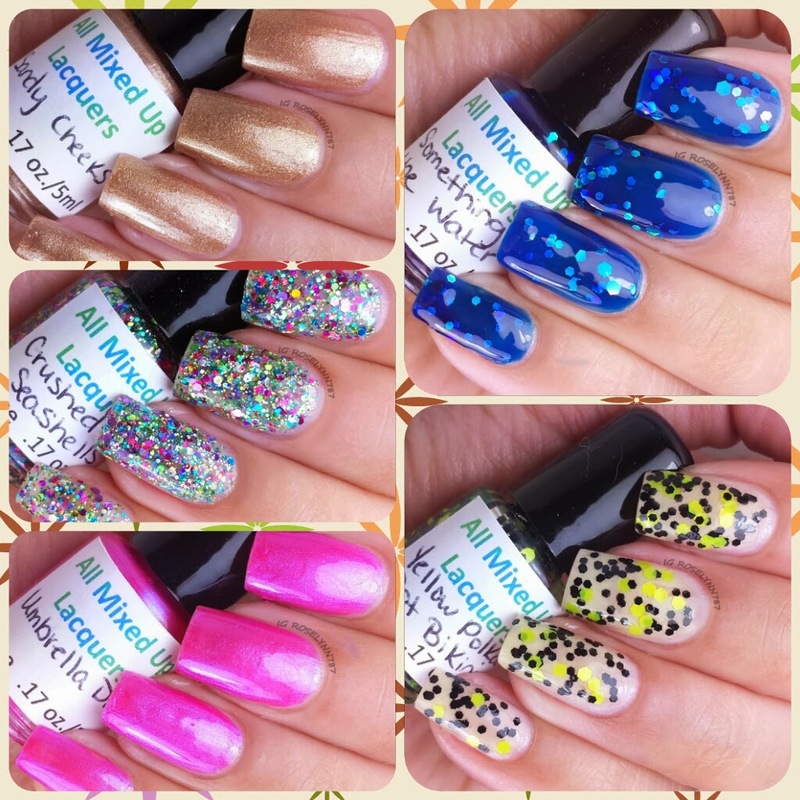 In today's post I'll be showing you the Life is a Beach Collection by All Mixed Up Lacquers. Oh how I love the play on words. 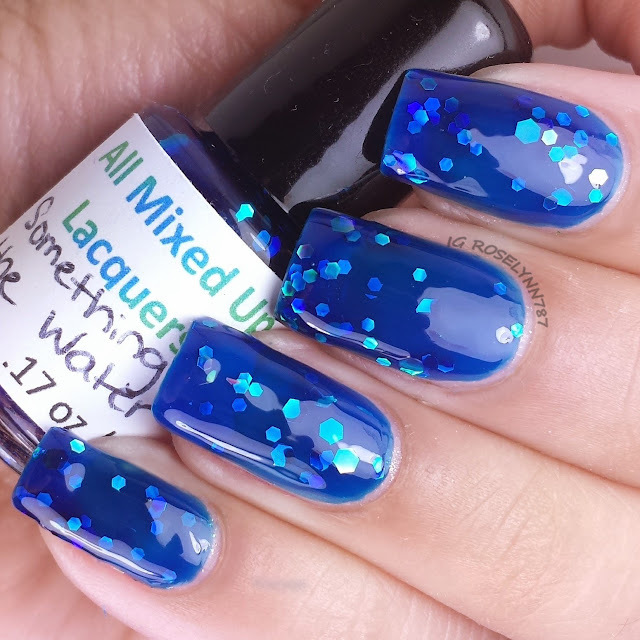 This is my first time trying out All Mixed Up Lacquers, 5-free indie polish, so I was extremely anxious to start swatching. Life is a Beach is a 5-piece collection consisting of two glitter bombs, one jelly, and two shimmer polishes. Let's take a closer look my nail lovers! 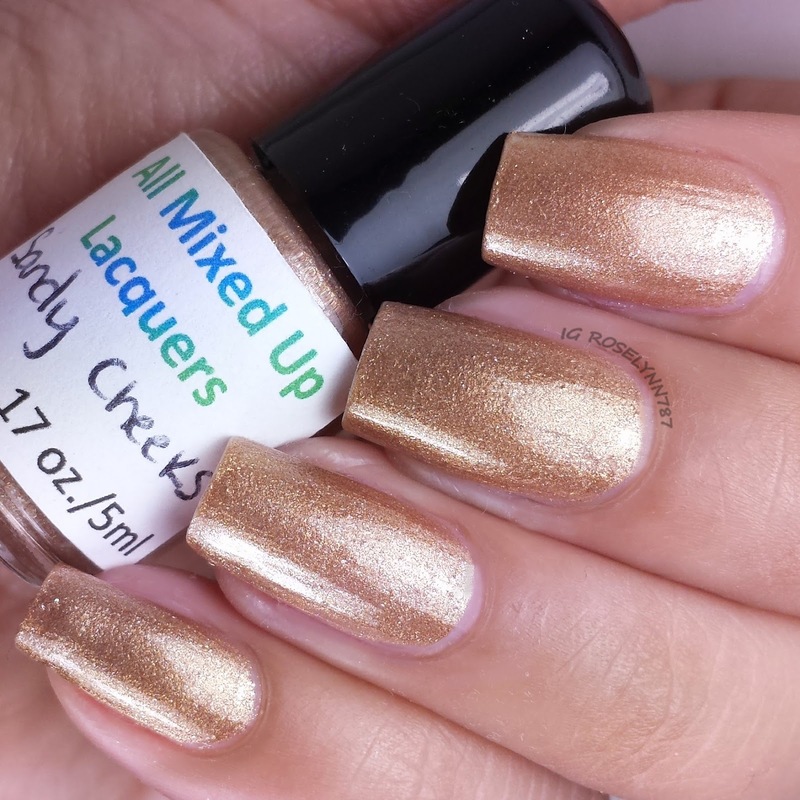 Sandy Cheeks is a golden sandy color with a beautiful shimmering finish. 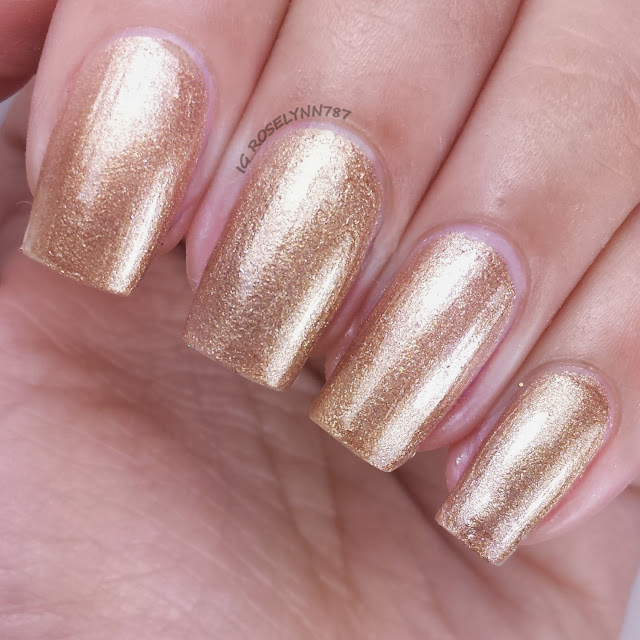 I cannot help but giggle at the name of this polish. All I kept thinking of was brushing sand off your bum at the beach haha. 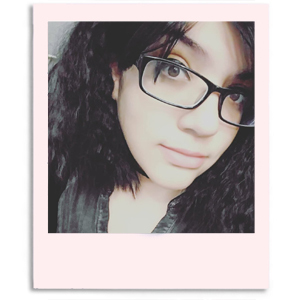 I really like this shade though not best on my skin-tone. Very elegant in tone. 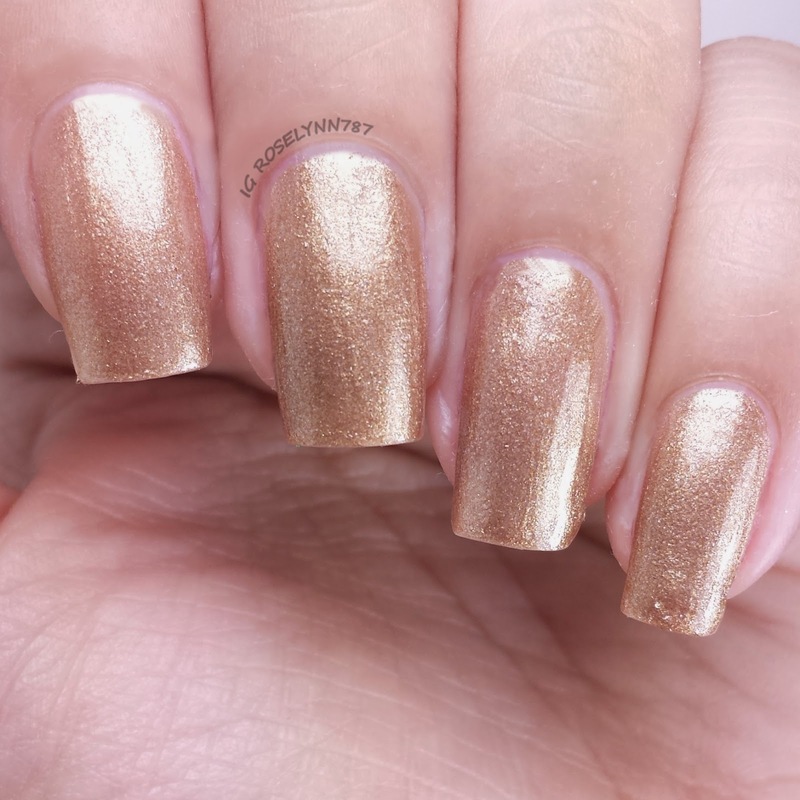 Swatched over a clear base coat, used two thin coats, and sealed with a fast drying topcoat. Formula was great, I had no issues with the brush strokes and no streaking whatsoever. Sheer in one coat but I found it opaque enough for my tastes in two thin coats. 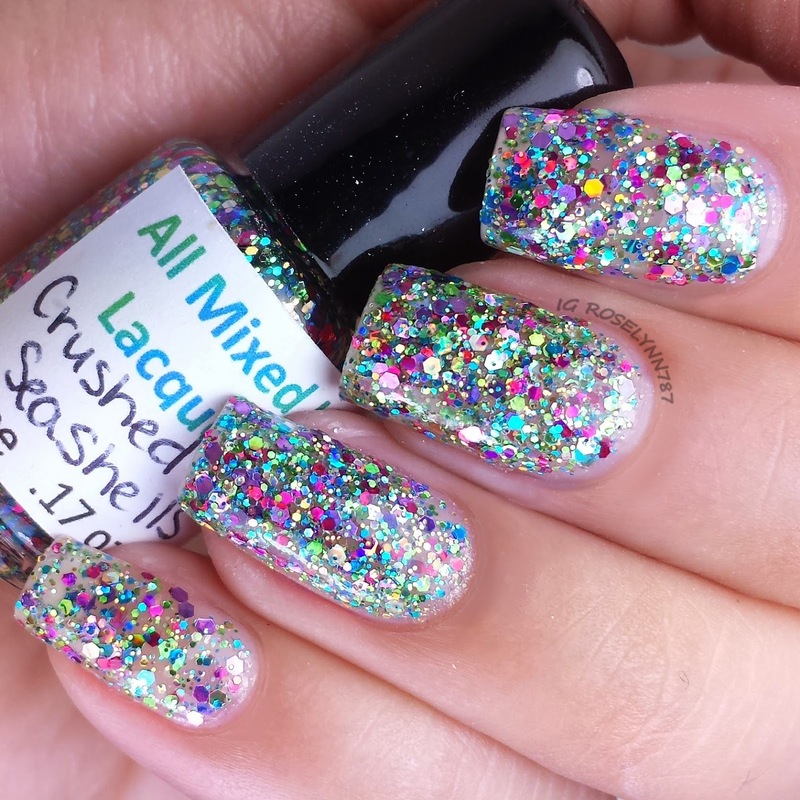 Crushed Seashells is a glitter base explosion filled with multi-colored and sized hex glitters. 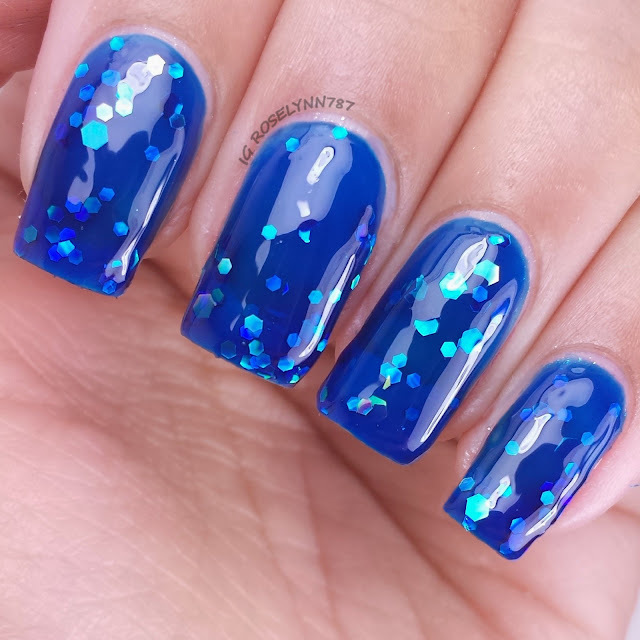 This polish is incredible! It's made to look like the crushed shells you'd find in the surf at the beach. I'll admit I was a bit on the fence about it until I actually put it on. Wow. 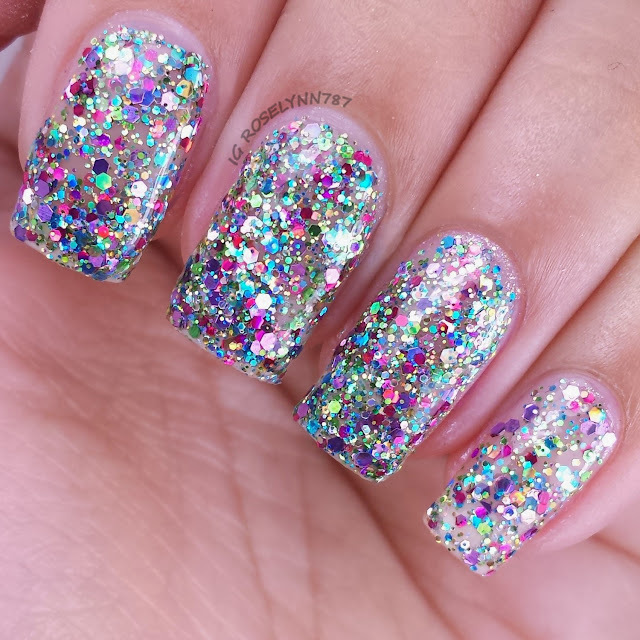 So much sparkle madness. Swatched over a clear base coat, used 2 thin coats using the dabbing method, and sealed with a topcoat. I decided against an undie since these glitters are so closely packed together to give nice coverage. Since I was using a mini bottle the formula was a little bit on the thick side, however, you should not experience this problem in a full bottle.Make sure you seal this beauty in with a topcoat to smooth down the glitters since it's so jam-packed. 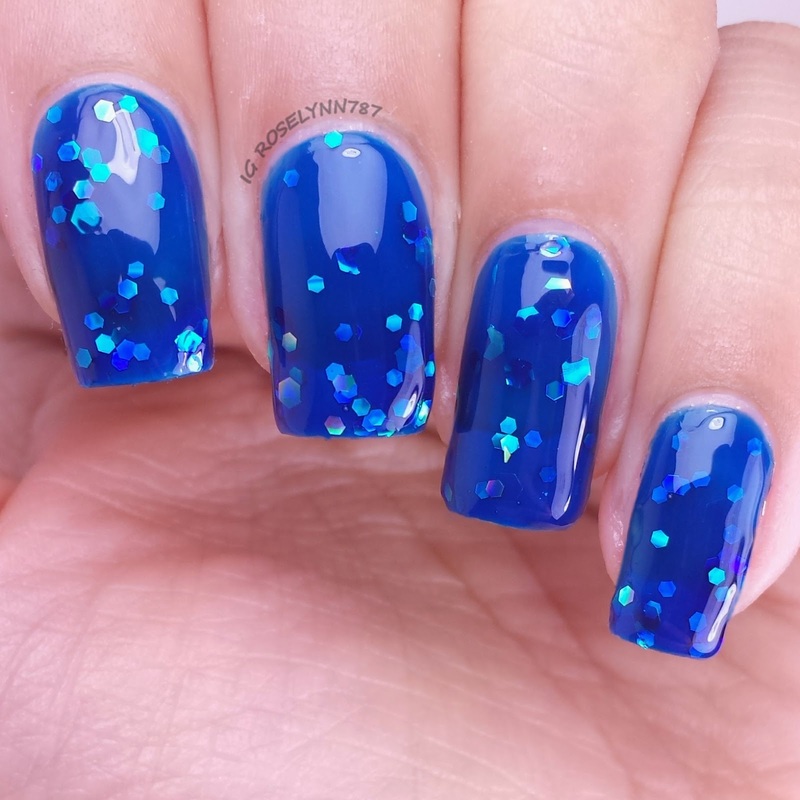 Something in the Water is a deep blue jelly polish filled with teal and blue hex glitters. This polish is like the textbook definition of a jelly sandwich! It looks incredible so much so that it looks like I photoshopped the color onto my nail. I assure you that's not the case, haha. Swatched over a clear base coat, used two thin coats, and sealed with a topcoat. If it weren't for the formula experience I would of said this beauty was my favorite from the collection. Because I was using a mini bottle, the formula was thick and a little difficult to work with. I was assured this isn't the case with the full size version. In any case, make sure you let each layer dry completely before applying the next to avoid clumping. Umbrella Drink is a bright pink polish with blue and purple shimmers all throughout. 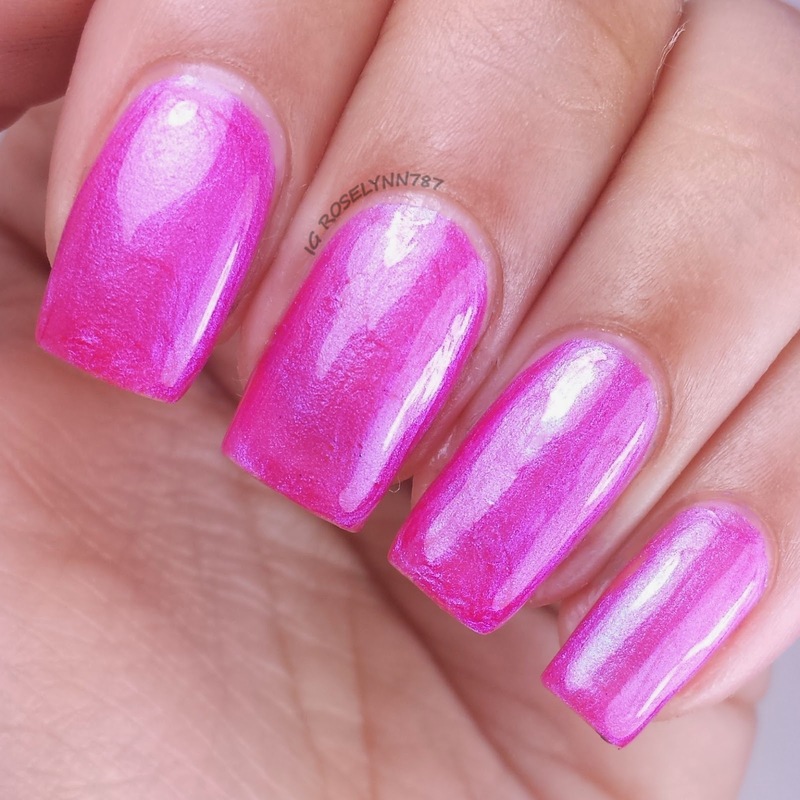 I usually don't like the color pink on me but this shade swayed me to the pink side. The blue and purple shimmers are really apparent in direct daylight. Swatched over a clear base coat, used two thin coats, and sealed with a topcoat. Formula was excellent and applied smoothly without any trouble. 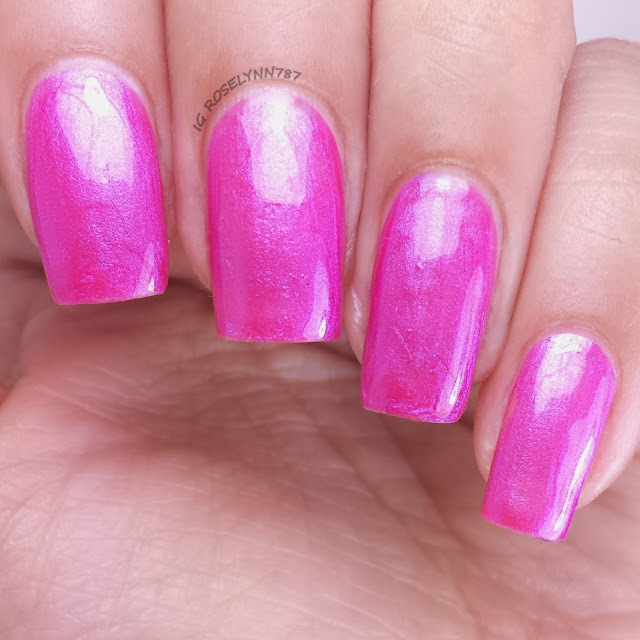 I was impressed by how opaque this polish was in a single layer, I only need two for full opacity. Yellow Polka Dot Bikini is a clear glitter topper filled with black and yellow small hex glitters. Who else is singing the song with me? It was an itsy-bitsy teenie weenie yellow polka dot bikini that she wore for the first time today! Yeah, you're welcome for getting that stuck in your head all day. This is hands down my favorite one in the collection and overall must-have. Swatched over Orly First Kiss, used two coats with the dabbing method, and sealed with a topcoat. Excellent formula, no glitter fishing, and gave me no trouble applying. As I mentioned, I did have to use the dabbing method to spread the glitters as I liked. Definitely seal with a topcoat to keep those glitters smoothed out. Overall I'm loving the variation in this collection, it gives you a little bit of everything. My favorites are without a doubt the glitter toppers especially Yellow Polka Dot Bikini. Formulas and consistency were pretty great throughout the different finishes. As I mentioned, the mini bottles gave me a bit of trouble making some of them thicker than intended. But these issues should not be encountered in the full size bottles which is what the shop sales. Each bottle retails for $6.50 and the whole collection is available for $32.00. Go pick up your summer favorite! Make sure you follow All Mixed Up Lacquers for latest release, stock info, and sales!